What do you do before you’re quite sure something actually exists? That’s the question artists who were instinctively feeling the pull of a new musical style were sorting through in the late stages of 1947 before that musical style had been validated by commercial response and really even confirmed by an ongoing give and take between artists themselves. The handful of records released in this nascent field to date were a combination of far-flung experiments, some creative tweaking of existing prototypes and a few oddball outliers that really fit nowhere else, all seemingly unrelated perhaps but soon to be embraced by the same burgeoning audience craving something new, different and exciting. But as of November 16, 1947 when Crown Prince Waterford entered the studio for his one and only session with Capitol Records it was fair to say that rock ‘n’ roll was merely an unsubstantiated rumor. A hazy collection of intriguing sounds without a firm identity. A whisper on the wind. Yet Waterford listened all the same. Who really knows what Capitol Records were thinking signing such a wildly colorful character as Charles Waterford in the first place. Though a veteran of some noteworthy bands in black music, Jay McShann’s jazz-blues outfit in particular, he wasn’t exactly overflowing with name recognition, even when he bestowed the Crown Prince moniker on himself to better forge a memorable identity. But having established themselves rather quickly as the fourth major record label they set their sights on expanding their potential market and started a subsidiary called Capitol Americana to record artists from the fringes of music society, namely less polished artists than the mainstream pop acts they made their reputation on. Artists like Crown Prince Waterford… for nobody was less polished than he. Capitol assembled a crack studio crew around him who were professional enough to keep Waterford focused and versatile enough to handle whatever material he brought to the table. Maxwell Davis on sax, Pete Johnson on piano and Tiny Webb on guitar anchored this group for a rare double session in order to give them enough cuts to endure a prolonged recording ban that was due to start when 1948 rang in. I’m sure none of them knew quite what to expect out of Waterford, but with eight songs due to be recorded they’d be able to find enough among them to make it worthwhile. Whether or not Waterford was fully aware of the changes happening around him in the music community since Roy Brown blasted the ceiling off the staid environment two months earlier we don’t know, he didn’t leave behind his memoirs for us to read, but the thing is the Crown Prince wasn’t exactly a mild, quiet sort of performer even before rock reared its head. What the new landscape did for him if nothing else was to provide him with a far more hospitable climate for what he did best – wail like a wild man. That was shown with the top side of this release, the exhilarating Move Your Hand Baby, a song which was as blatantly suggestive as possible and equally unhinged musically. But Capitol Records, despite being a major label prone to being aghast at such debauchery, was apparently not so deaf and dumb as to not be able to discern it was by far his best effort from the session and so they issued it as his first release rather than have him committed to an institution for such crimes against nature. But just because they released it hoping to catch lightning in a bottle with this growing rumble of rock ‘n’ roll that was being faintly heard by December, they still might’ve wanted to hedge their bets should that style prove to be the commercial realm of only degenerates and recently released prisoners. So they turned to this – Weeping Willow Blues – a song that was an awkward amalgam of multiple established genres for its B-side. The blues may be the fundamental base of most non-European forms of music, from jazz to gospel to rock, but blues are usually credited too much when it comes to mapping the DNA of those styles. In truth their blues roots are somewhat remote or detached in all of those forms of music and that’s because beyond some basic structural concepts everything else about the blues as we know it, from instrumentation to vocal style to point of view, is hardly present in recognizable form in any of its so called off-spring, at least in 1947. But because the blues was so consistent in what it presented it also had a fairly consistent and reliable fan base to try and reach, which seems to have been taken into account with how this kicks off with Tiny Webb’s guitar taking on a very definite bluesy tone to try and pull in that audience as well. Weeping Willow Blues is slow and contemplative, two words that you never thought you’d hear referring to anything Crown Prince Waterford had a hand in. That said, it’s plainly obvious that he’s not exactly comfortable matching the mood Webb sets, as his vocals start off holding back as best he can before he wriggles free of those constraints and over-amplifies the close of each line. Like a figure he’s often compared to, Wynonie Harris, whose lusty roar was utilized on virtually every song he tackled up to and probably including Too-ra-loo-ra-loo-ral (An Irish Lullaby), Waterford had trouble any time he was forced to downshift in his vocal approach. Like a car that can’t drop below third gear it makes for some harrowing rides on busy streets, something he seems to be at least somewhat aware of here as he pumps the breaks frequently in an attempt to stay within marked lanes, but he’s had so little practice at slowing down apparently that he’s got no touch when doing so. All of this makes mincemeat of the lyrics, which he himself crafted with a fair amount of insight. The vignettes he serves up to try and convey his despair are pretty well conceived. There’s nothing eye-opening about them maybe but they’re at least effective in setting the mood. It’s just that Waterford’s OWN mood is far too boisterous for them to ring true. Filled with too many open-throated cries which are exacerbated by the fact he’s acting like a three year old who’s cranking the volume knob with absolutely no awareness that they’re the ones responsible for the walls of the room shaking from the sound, the Crown Prince manages to undermine his own lyrics and – more tragically – the otherwise solid accompaniment of the band who plow ahead with admirable determination in the face of a vocal hurricane. This is mostly Tiny Webb’s show so we need to at least give him a moment or two in the spotlight if we can wrest the microphone away from Waterford long enough to do so. Mitchell “Tiny” Webb wasn’t tiny at all, he was big, more than 300 pounds according to some, but he died young and never got his just due for being one of the most versatile guitarists of his era. He played with a wide array of artists, including Jay McShann earlier in 1947 (after Waterford had long since departed his employ), and would in the future appear on sides from rock legends Ray Charles, Percy Mayfield and Little Willie Littlefield as well as such diverse non-rock figures as Hadda Brooks and Lloyd Glenn. He was a regular in the Los Angeles studio scene, in fact maybe the first real rock session guitarist of note, which came partly as the result of often working with Maxwell Davis who of course is playing on this too. Webb’s guitar was featured prominently on Bumble Bee Slim’s 1951 cut Ida Red is where Chuck Berry freely admitted he got the entire structure for his own debut record Maybellene. But Tiny Webb would get his most prominent showcase in the group Eddie Williams & His Brown Buddies, a somewhat short-lived assemblage of “name” musicians from a wide array of stylistic origins who’d release a string of very fine rock records in mid-1949 before splintering. Webb was what could best be termed a “discreet” guitarist, someone who could remain in the background while still delivering noteworthy fills and accents which would contribute greatly to the overall ambiance of a track. On Weeping Willow Blues however he takes more of a lead role only to have Waterford run roughshod over him at times. But when you allow yourself to block out the wayward Crown Prince what you’re left with is some very deft playing by Webb, particularly his jazzy mid-song solo, which is the other musical milieu this borrows from as the blues aspect largely gets neglected after the intro and in Waterford’s overall theme. There’s really not much else to this, Pete Johnson is his typical class act on piano, but he’s mostly playing triplets and only occasionally tickling the keys as necessary in order to prevent Waterford from overwhelming Webb altogether. The others sit this out completely until the very end when Davis adds a faint distant coda on sax to bring this to a rather merciful conclusion. As often is the case early in this music’s tenure when the artist, the band or the record label isn’t fully convinced of the potency of unfettered rock ‘n’ roll these types of stylistic hybrids fail to satisfy anybody, including the artist in this case. Waterford is not the kind of singer who can be easily contained and often trying to rein him in does more harm than good to whatever song he’s performing. Weeping Willow Blues wasn’t going to be great no matter who was singing it, there’s too much of yesterday in its blueprint to cut it in today’s world, especially in a musical genre that is busy trying to define tomorrow. But at least if it had been cut by somebody who stayed within himself more than Waterford was capable of it wouldn’t have distracted from the one component that is worth hearing, Tiny Webb. But therein lies another problem, at least in terms of trying to evaluate this in a pure rock setting. As impressively as Webb plays, WHAT he’s playing, while perfectly fitting for this song – at least until somebody opens his mouth to sing – isn’t exactly appropriate for rock ‘n’ roll, not even at this stage before rock has heard from many guitarists other than in mostly muted supporting roles. The problem is of course that nobody has figured out yet just how to best highlight the instrument in a way that differentiates it from jazz or blues. The fact that Webb incorporates both of those approaches in what he plays here only highlights that dilemma. We like what we hear, but we also know that what we hear him playing now just won’t cut it in this field and it’ll quickly be shown the door making this track merely an oddity, not anything that will have an effect on rock around the next bend. Because of that this has to be chalked up as a creative misfire and another example in what will be a long line of examples, of just why rock had to completely shed itself of all vestiges of past musical styles to forge a style all its own. 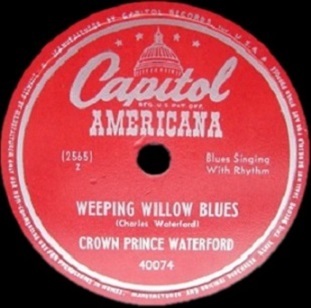 Leave a reply on "Crown Prince Waterford: “Weeping Willow Blues”"